Beginning in September, Mt. Rainier starts exploding with color. Flames of transitioning plants, shrubs and trees light up the region with vibrant orange, blazing red, deep burgundy, and bright yellow. Bring your camera and snacks, wear toasty layers, and get outside to see the color while it lasts. RootsRated offers five ideas to get you on your way. Double the visual feast with a mirrored view of color bouncing off the lakes. The landscape is one you’ve seen before in photographs, as it’s an iconic image of Mt. Rainier. There is an easy 2.75-mile loop trail leading to the lake. Be sure to do this one by the end of September to avoid snow. Rainier is a great place to find blackberries, blueberries, salmon berries and huckleberries. Late August through September is the ideal time for berry picking. You’re allowed two quarts per person per day in the National Park, and three gallons each in the National Forest. If you want to make a day of it, Noble Nob Trail and Indian Henry’s Hunting Grounds through Rampart Ridge are known for having an abundance of huckleberries. Noble Nob is a 4-mile hike and Indian Henry’s is a more difficult 14-mile hike. Skyline Trail is a 5.4-mile loop that, on a clear day, offers spectacular views of Mt. Adams, the Tatoosh Peaks, Mt. Hood, the Nisqually glacier, and even Oregon’s Mt. St. Helens. The region is known as 'Paradise', and when you get to Panorama Point, you’ll see why. 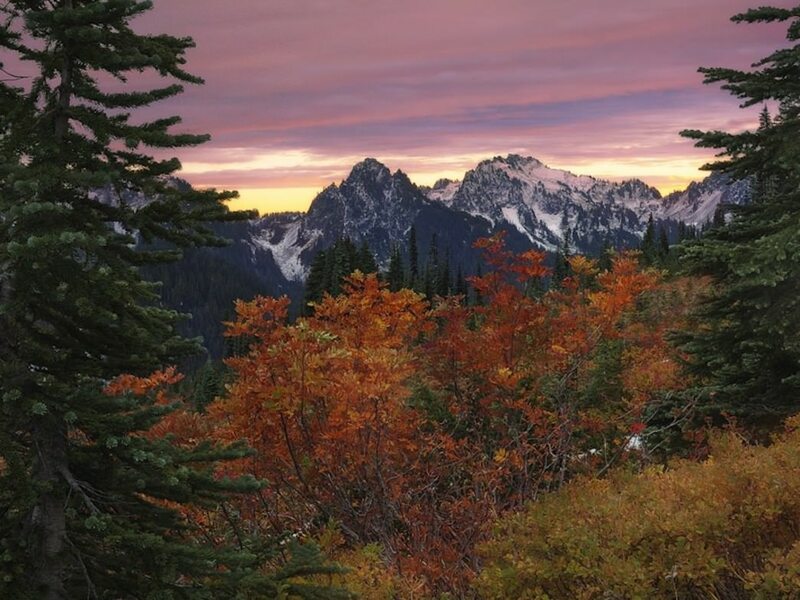 Go for an autumn drive along Washington’s premier touring road. Chinook Scenic Byway travels through Mt. Rainier National Park along the northeast corridor between Naches and Enumclaw. 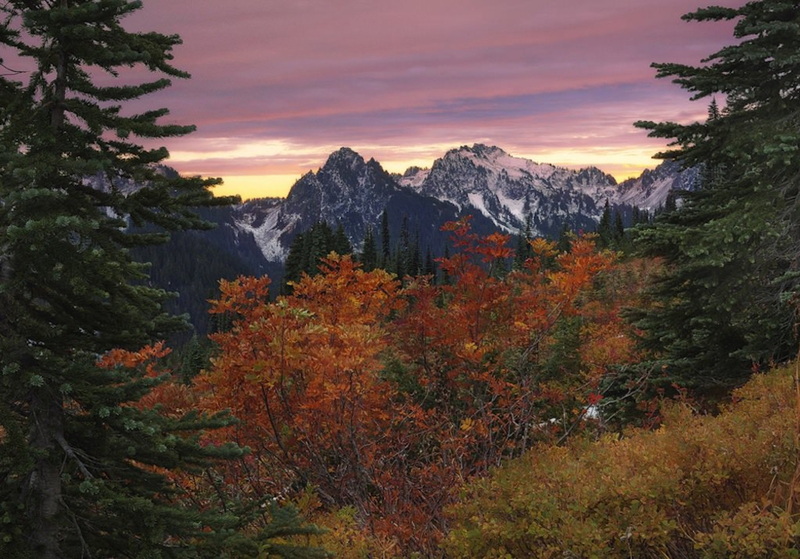 To the south, White Pass Scenic Byway offers a 78-mile loop around Mt. Rainier, including a stop at Reflection Lakes. Nature puts on a brilliant show you can see right from the road. There are plenty of places to pull over and enjoy a picnic and take photographs. Bring a thermos of spicy hot apple cider and your hiking boots just in case you want to hit one of the many trails along the byways. Go early in the season to avoid road closures due to snow. The heritage steam train in Elbe offers an Autumn Leaves ride through the foothills of Mt. Rainier. It runs on weekends from October 5-22 nd . You’ll see color from cottonwood, alder, and maple trees. In late October, on the 26 th and 27 th , families can take costume-clad kids on the Pumpkin Express to the Mineral Lake Pumpkin Patch where they can pick out their own pumpkin to take home. Written by Leah DeAngelis for RootsRated.